Jupiter is the largest planet in the solar system. Its diameter is 88,846 miles (142,984 kilometers), more than 11 times that of Earth, and about one-tenth that of the sun. It would take more than 1,000 Earths to fill up the volume of the giant planet. When viewed from Earth, Jupiter appears brighter than most stars. It is usually the second brightest planet -- after Venus. Jupiter is the fifth planet from the sun. Its mean (average) distance from the sun is about 483,780,000 miles (778,570,000 kilometers), more than five times Earth's distance. Ancient astronomers named Jupiter after the king of the Roman gods. Astronomers have studied Jupiter with telescopes based on Earth and aboard artificial satellites in orbit around Earth. In addition, the United States has sent six space probes (crewless exploratory craft) to Jupiter. Astronomers witnessed a spectacular event in July 1994, when 21 fragments of a comet named Shoemaker-Levy 9 crashed into Jupiter's atmosphere. The impacts caused tremendous explosions, some scattering debris over areas larger than the diameter of Earth. 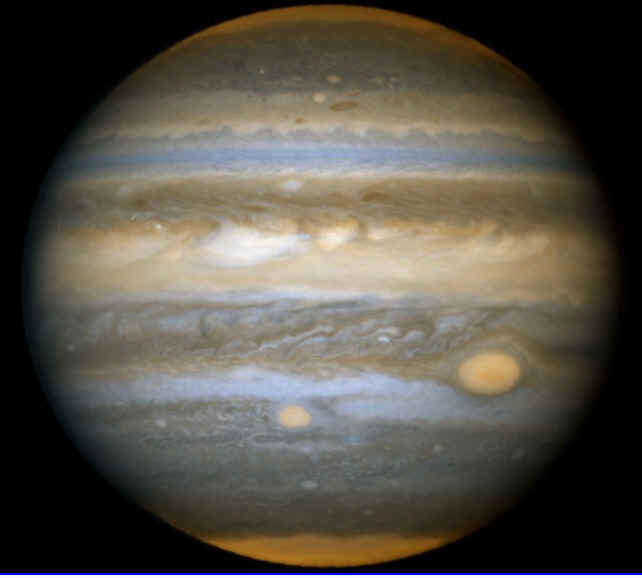 Jupiter is a giant ball of gas and liquid with little, if any, solid surface. Instead, the planet's surface is composed of dense red, brown, yellow, and white clouds. The clouds are arranged in light-colored areas called zones and darker regions called belts that circle the planet parallel to the equator. Jupiter travels around the sun in a slightly elliptical (oval-shaped) orbit. The planet completes one orbit in 4,333 Earth days, or almost 12 Earth years. As Jupiter orbits the sun, the planet rotates on its axis, an imaginary line through its center. The axis is tilted about 3¡. Scientists measure tilt relative to a line at a right angle to the orbital plane, an imaginary surface touching all points of the orbit. Jupiter rotates faster than any other planet. It takes 9 hours 56 minutes to spin around once on its axis, compared with 24 hours for Earth. Scientists cannot measure the rotation of the interior of the giant planet directly, so they have calculated the speed from indirect measurements. They first calculated the speed using an average of the speeds of the visible clouds that move with interior currents, except for a more rapid zone near the equator. Jupiter sends out radio waves strong enough to be picked up by radio telescopes on Earth. Scientists now measure these waves to calculate Jupiter's rotational speed. The strength of the waves varies under the influence of Jupiter's magnetic field in a pattern that repeats every 9 hours 56 minutes. Because the magnetic field originates in Jupiter's core, this variation shows how fast the plant's interior spins. Jupiter's rapid rotation makes it bulge at the equator and flatten at the poles. The planet's diameter is about 7 percent larger at the equator than at the poles. Jupiter is heavier than any other planet. Its mass (quantity of matter) is 318 times larger than that of Earth. 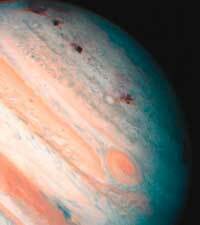 Although Jupiter has a large mass, it has a relatively low density. Its density averages 1.33 grams per cubic centimeter, slightly more than the density of water. The density of Jupiter is about 1/4 that of Earth. Because of Jupiter's low density, astronomers believe that the planet consists primarily of hydrogen and helium, the lightest elements. Earth, on the other hand, is made up chiefly of metals and rock. Jupiter's mix of chemical elements resembles that of the sun, rather than that of Earth. Jupiter may have a core made up of heavy elements. The core may be of about the same chemical composition as Earth, but 20 or 30 times more massive. The force of gravity at the surface of Jupiter is up to 2.4 times stronger than on Earth. Thus, an object that weighs 100 pounds on Earth would weigh as much as 240 pounds on Jupiter. The atmosphere of Jupiter is composed of about 86 percent hydrogen, 14 percent helium, and tiny amounts of methane, ammonia, phosphine, water, acetylene, ethane, germanium, and carbon monoxide. The percentage of hydrogen is based on the number of hydrogen molecules in the atmosphere, rather than on their total mass. Scientists have calculated these amounts from measurements taken with telescopes and other instruments on Earth and aboard spacecraft. These chemicals have formed colorful layers of clouds at different heights. The highest white clouds in the zones are made of crystals of frozen ammonia. Darker, lower clouds of other chemicals occur in the belts. At the lowest levels that can be seen, there are blue clouds. Astronomers had expected to detect water clouds about 44 miles (70 kilometers) below the ammonia clouds. However, none have been discovered at any level. 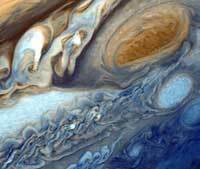 Jupiter's most outstanding surface feature is the Great Red Spot, a swirling mass of gas resembling a hurricane. The widest diameter of the spot is about three times that of Earth. The color of the spot usually varies from brick-red to slightly brown. Rarely, the spot fades entirely. Its color may be due to small amounts of sulfur and phosphorus in the ammonia crystals. The edge of the Great Red Spot circulates at a speed of about 225 miles (360 kilometers) per hour. The spot remains at the same distance from the equator but drifts slowly east and west. The zones, belts, and the Great Red Spot are much more stable than similar circulation systems on Earth. Since astronomers began to use telescopes to observe these features in the late 1600's, the features have changed size and brightness but have kept the same patterns. The temperature at the top of Jupiter's clouds is about -230 degrees F (-145 degrees C). Measurements made by ground instruments and spacecraft show that Jupiter's temperature increases with depth below the clouds. The temperature reaches 70 degrees F (21 degrees C) -- "room temperature" -- at a level where the atmospheric pressure is about 10 times as great as it is on Earth. Scientists speculate that if Jupiter has any form of life, the life form would reside at this level. Such life would need to be airborne, because there is no solid surface at this location on Jupiter. Scientists have discovered no evidence for life on Jupiter. Near the planet's center, the temperature is much higher. The core temperature may be about 43,000 degrees F (24,000 degrees C) -- hotter than the surface of the sun. Jupiter is still losing the heat produced when it became a planet. Most astronomers believe that the sun, the planets, and all the other bodies in the solar system formed from a spinning cloud of gas and dust. The gravitation of the gas and dust particles packed them together into dense clouds and solid chunks of material. By about 4.6 billion years ago, the material had squeezed together to form the various bodies in the solar system. The compression of material produced heat. So much heat was produced when Jupiter formed that the planet still radiates about twice as much heat into space as it receives from sunlight. Like Earth and many other planets, Jupiter acts like a giant magnet. The force of its magnetism extends far into space in a region surrounding the planet called its magnetic field. Jupiter's magnetic field is about 14 times as strong as Earth's, according to measurements made by spacecraft. Jupiter's magnetic field is the strongest in the solar system, except for fields associated with sunspots and other small regions on the sun's surface. Scientists do not fully understand how planets produce magnetic fields. They suspect, however, that the movement of electrically charged particles in the interior of planets generates the fields. Jupiter's field would be so much stronger than Earth's because of Jupiter's greater size and faster rotation. Jupiter's magnetic field traps electrons, protons, and other electrically charged particles in radiation belts around the planet. The particles are so powerful that they can damage instruments aboard spacecraft operating near the planet. Within a region of space called the magnetosphere, Jupiter's magnetic field acts as a shield. The field protects the planet from the solar wind, a continuous flow of charged particles from the sun. Most of these particles are electrons and protons traveling at a speed of about 310 miles (500 kilometers) per second. The field traps the charged particles in the radiation belts. The trapped particles enter the magnetosphere near the poles of the magnetic field. On the side of the planet away from the sun, the magnetosphere stretches out into an enormous magnetic tail, often called a magnetotail, that is at least 435 million miles (700 million kilometers) long. Radio waves given off by Jupiter reach radio telescopes on Earth in two forms -- bursts of radio energy and continuous radiation. Strong bursts occur when Io, the closest of Jupiter's four large moons, passes through certain regions in the planet's magnetic field. Continuous radiation comes from Jupiter's surface as well as from high-energy particles in the radiation belts. Jupiter has 16 satellites that measure at least 6 miles (10 kilometers) in diameter. It also has many smaller satellites. Jupiter's four largest satellites, in order of their distance from Jupiter, are Io, Europa, Ganymede, and Callisto. These four moons are called the Galilean satellites. The Italian astronomer Galileo discovered them in 1610 with one of the earliest telescopes. Io has many active volcanoes, which produce gases containing sulfur. The yellow-orange surface of Io probably consists largely of solid sulfur that was deposited by the eruptions. Europa ranks as the smallest of the Galilean satellites, with a diameter of 1,945 miles (3,130 kilometers). Europa has a smooth, cracked, icy surface. The largest Galilean satellite is Ganymede, with a diameter of 3,273 miles (5,268 kilometers). Ganymede is larger than the planet Mercury. 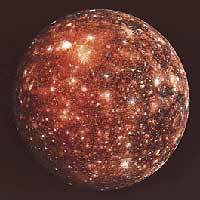 Callisto, with a diameter of 2,986 miles (4,806 kilometers), is slightly smaller than Mercury. 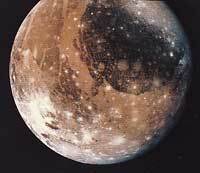 Ganymede and Callisto appear to consist of ice and some rocky material. The two satellites have many craters. Jupiter's remaining satellites are much smaller than the Galilean moons. Amalthea and Himalia are the next largest. Potato-shaped Amalthea is about 163 miles (262 kilometers) in its long dimension. Himalia is 106 miles (170 kilometers) in diameter. Most of the remaining satellites were discovered by astronomers using large telescopes on Earth. Scientists discovered Metis and Adrastea in 1979 by studying pictures that had been taken by the Voyager spacecraft. Jupiter has three thin rings around its equator. They are much fainter than the rings of Saturn. Jupiter's rings appear to consist mostly of fine dust particles. The main ring is about 20 miles (30 kilometers) thick and more than 4,000 miles (6,400 kilometers) wide. It circles the planet inside the orbit of Amalthea. In March 1993, astronomers Eugene Shoemaker, Carolyn Shoemaker, and David H. Levy discovered a comet near Jupiter. The comet, later named Shoemaker-Levy 9, probably once orbited the sun independently, but had been pulled by Jupiter's gravity into an orbit around the planet. When the comet was discovered, it had broken into 21 pieces. The comet probably had broken apart when it passed close to Jupiter. Calculations based on the comet's location and velocity showed that the fragments would crash into Jupiter's atmosphere in July 1994. Scientists hoped to learn much about the effects of a collision between a planet and a comet. Astronomers at all the major telescopes on Earth turned their instruments toward Jupiter at the predicted collision times. Scientists also observed Jupiter with the powerful Hubble Space Telescope, which is in orbit around Earth; and the remotely controlled space probe Galileo, which was on its way to Jupiter. The fragments fell on the back side of Jupiter as viewed from Earth and the Hubble Space Telescope. But the rotation of Jupiter carried the impact sites around to the visible side after less than half an hour. Scientists estimate that the largest fragments were about 0.3 to 2.5 miles (0.5 to 4 kilometers) in diameter. The impacts were directly observable from Galileo, which was within about 150 million miles (240 million kilometers) from Jupiter. However, damage to certain of the probe's instruments limited its ability to record and send data. The impacts caused large explosions, probably due to the compression, heating, and rapid expansion of atmospheric gases. The explosions scattered comet debris over large areas, some with diameters larger than that of Earth. The debris gradually spread into a dark haze of fine material that remained suspended for several months in Jupiter's upper atmosphere. If a similar comet ever collided with Earth, it might produce a haze that would cool the atmosphere and darken the planet by absorbing sunlight. If the haze lasted long enough, much of Earth's plant life could die, along with the people and animals that depend on plants. The United States has sent six space probes to Jupiter: (1) Pioneer 10, (2) Pioneer-Saturn, (3) Voyager 1, (4) Voyager 2, (5) Ulysses, and (6) Galileo. Pioneer 10 was launched in 1972 and flew within 81,000 miles (130,000 kilometers) of Jupiter on Dec. 3, 1973. The probe revealed the severe effects of Jupiter's radiation belt on spacecraft. Pioneer 10 also reported the amount of hydrogen and helium in the planet's atmosphere. In addition, the probe discovered that Jupiter has an enormous magnetosphere. Pioneer-Saturn flew within 27,000 miles (43,000 kilometers) of Jupiter in December 1974. The craft provided close-up photographs of Jupiter's polar regions and data on the Great Red Spot, the magnetic field, and atmospheric temperatures. Voyager 1 and Voyager 2 flew past Jupiter in March and July 1979, respectively. These craft carried more sensitive instruments than did the Pioneers, and transmitted much more information. Astronomers used photographs taken by the Voyagers to make the first detailed maps of the Galilean satellites. The Voyagers also revealed sulfur volcanoes on Io, discovered lightning in Jupiter's clouds, and mapped flow patterns in the cloud bands. Ulysses was launched in October 1990 and passed by Jupiter in February 1992. The European Space Agency, an organization of Western European nations, had built the probe mainly to study the sun's polar regions. Scientists used the tremendous gravitational force of Jupiter to put Ulysses into an orbit that would take it over the sun's polar regions. As Ulysses passed by Jupiter, it gathered data indicating that the solar wind has a much greater effect on Jupiter's magnetosphere than earlier measurements had suggested. Galileo began its journey to Jupiter in October 1989. The craft released an atmospheric probe in July 1995. In December 1995, the probe plunged into Jupiter's atmosphere. The probe penetrated deep into the cloud layers and measured the amount of water and other chemicals in the atmosphere. Also in December 1995, Galileo went into orbit around Jupiter. Over the next several years, the craft monitored Jupiter's atmosphere and observed the planet's major satellites. Galileo's mission was extended in 1997 and again in 1999. Eventually, however, the craft ran low on fuel. In September 2003, mission managers intentionally crashed Galileo into Jupiter's atmosphere to avoid any risk of the craft crashing into and contaminating Jupiter's moon Europa. Galileo's observations of Europa had shown that it might have an ocean below its surface capable of supporting life. By Comparison: If you weigh 100 pounds on Earth, you would weigh 214 pounds on Jupiter.